SPAIN – Twenty-four Astera AX1 Pixel Tubes were utilized for one of 20 stunning site-specific lighting installations created by individual artists for the first UMBRA Light Festival in Vitoria-Gastiez, Spain. The beautiful, vibrant and highly multicultural historical capital city and seat of government of the Basque Autonomous Community in Alava, northern Spain, came alive for three days, offering creatives, visitors and lighting enthusiasts from all over Spain, Europe and much further afield a chance to redefine the city and see it in some new, exciting and reimagined urban contexts. UMBRA was organized by ARGIA 3 Asociación Cultural and curated by a new collective comprising Rafael Gallego, the principal of Aureolighting, Joaquín Pérez-Goicoechea, founding partner of AGi Architects and stage lighting designer, light artist, and founder of Studio & Light Carlos Torrijos – three individuals, all passionate about lighting. One of the technical sponsors was EES, Astera’s Spanish distributor who are based in San Sebastian. They made the AX1’s available which were utilized by Carlos Torrijos for his own work at the festival, “Buscando la Vida” (Searching for Life). 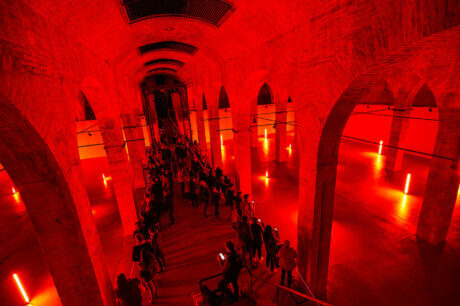 “Buscando la Vida” was staged in the former water reservoir next to the Palacio Montehermoso, a 16th century stately Renaissance building – one of two special underground spaces that became immersive light works during the event. The Palacio was linked to the ancient Depósito de Aguas (Water tank) by an underground corridor added in 1885. 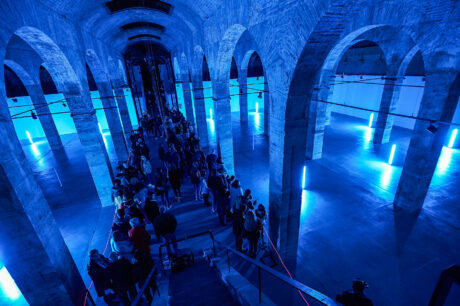 Since 1991 Palacio Montehermoso has served as a cultural centre for the city and region, and during UMBRA this extensive underground corridor with its imposing vaulted architecture was opened to the public allowing them to access the 1.365 m² large hall of the former water reservoir. 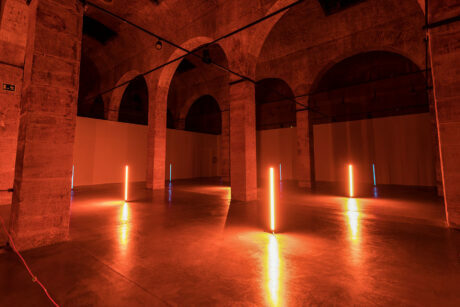 The thought-provoking ambience created as people were bathed in light was intended to encourage the existential process of pulling positive energy from inner darkness, searching the soul to find new meanings and ideas. Emphasizing the form and functionality of the room – a dark, closed off space – with light also helped explain the history and relevance of the location. Carlos chose to use the Pixel Tubes for the work because he wanted a clean and pure light in an expedient housing and something that was expediently packaged that would blend unobtrusively into this extraordinary environment. The AX1 produced the large amounts of light required but occupied minimal space. 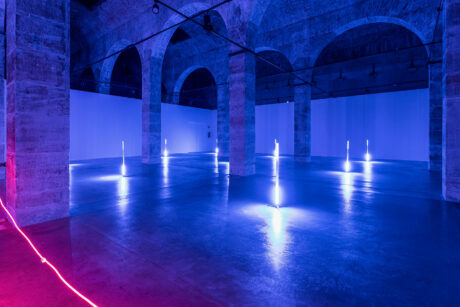 It was the first time he had used an Astera product and was extremely impressed with the results, reckoning that the AX1s are an “original and different” light source with “great possibilities” for light art installations like this, and for more conventional entertainment-based applications. He’d like to use the Tubes again and experiment with having greater control over the effects and operation for the next work. “I loved the reflection of the colors on the architecture and the dynamism of the actual light emanating from the Tubes” he commented. EES themselves were delighted to be involved in the first of what will hopefully become an annual event. Having recently added Astera to their product portfolio which features other premium brands, they like Astera’s diversity and the many new possibilities their ingenious wireless technology brings for lighting projects. The first UMBRA Light Festival was a massive success, pulling many people into Vitorio-Gastiez and creating a real buzz of excitement and creativity, and boosting an appreciation of the many unifying effects of lighting on social interaction.